- *warning* your import is large so will be done in multiple transactions from the browser. Please don't close your browser during upload. Aborting won't be possible. I think doing the plone training.plone.org is a good start. I think a good start would be looking at some simple bugs in either plone.importexport or in plone itself. We are commissioning some changes to plone.importexport right now but they should be finished in the next day or so so it would be good to see whats left after that is finished. Plone has many bugs marked as being suitable for beginners. if you look at its github trackers (there are different ones for different modules). thinking more probably the best way to start is add some tests once the current work on importexport is finished. I'm Aalekh Jain currently pursuing my B.tech and MS from IIIT-H, India. I have been exploring Plone over the past weeks and also played with it on my local machine. I have also gone through the documentation and training as well and I found Plone to be an exciting organization to contribute to. I've gone through a couple of threads on this topic and have tried to develop a decent understanding on this, which is to develop an addon which would provide an import/export solution even for non-techy users. Providing an easy to use UI which is built on top of the Plone restapi. Developing a mechanism to handle existing content and perform required action on them. Handling large files during import/export. Providing a solution for bulk update of required fields/contents. 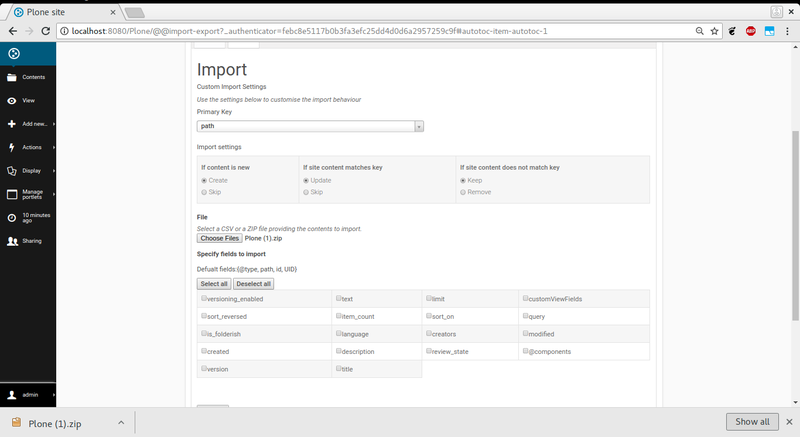 Integrating useful error logs (if any) along with the import/export tasks. Kindly guide me to proceed in this project for GSOC'19. Welcome to plone @ironmaniiith. All of that sounds good. But perhaps you need to install and use the current version of plone.importexport to get a feel for how it currently works? You might want to use one of the later branches as some work has already been done on it. Note however that the UI uses parts of the restapi internally for serialisation but is not actually connecting via REST itself. I've uploaded my draft on google summer of code website. Kindly review the draft and suggest required changes. I've merged one of the new PRs with lots of changes on and am now testing to see if this helps it build more easily. Unfortunately the tests still don't pass. Definitely, I've included that in my proposal as well. Sorry for the late response as I was previously involved in drafting the proposal which took me some time. Kindly suggest how should I further proceed? Meanwhile I am also following training docs. @ironmaniiith Not sure what you mean by log but there is currently a bug that the path exported is not the same kind as is needed for import. There is a PR to fix that which needs to be reviewed and potentially merged - https://github.com/collective/plone.importexport/pull/34. It makes sense that import and export use relative paths. Also you should be able to work around it by using UID instead.